Assume there is no MPLS between PE1 (R1) and PE2 (R3) (remove LDP protocol in PE routers). 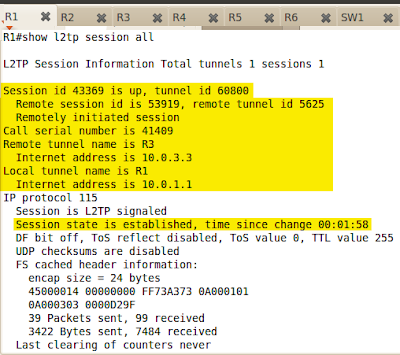 Based on the previous lab's assignment (lab 183), configure similar VLAN-based VPN between CE3 (R5) and CE4 (R4). Use L2TPv3 to accomplish the task. PE1 and PE2 are not using MP-BGP and LDP any more. Reachability in the cloud is purely OSPF routing domain (Layer3). It took a good while for the tunnel to be brought up. Be patient here! Ping from CE3 to CE4 should now work (also EIGRP adjacency between them too, like in lab 183).